…but do you know if they are on their phones? There’s plenty to worry about as a parent – are your kids eating enough veggies? Did they finish their homework? Did they grab their jackets during the mad rush to make it to the bus stop on time this morning? But the latest and increasingly threatening danger to your children’s health might be lurking just under your nose (literally). Blue light – part of the electromagnetic spectrum visible to the human eye – passes through the cornea and lens, reaching the retina and potentially damaging the cells found there. 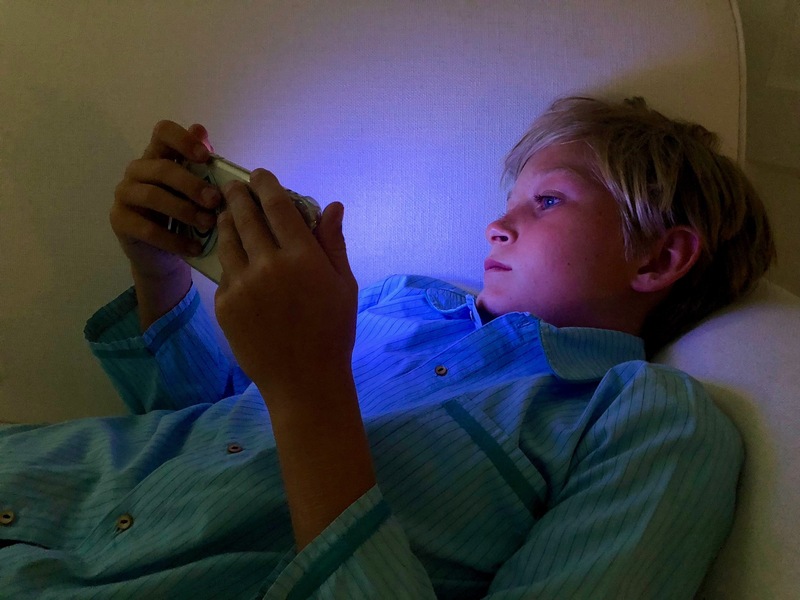 While blue light is found everywhere, the use of mobile phones, tablets and computers has drastically increased the amount of blue light reaching your children’s eyes. Based on the number of times you’ve had to buy new shoes, you know that your child is still growing and developing. This includes his or her eyes! Because their eyes are not fully developed, children are more sensitive to the effects of blue light. In fact, 65 percent of blue light can be transferred to the retina in young children (versus 20 percent in adults, whose lens are more developed and can absorb more blue light). According to the American Association of Pediatrics, children spend up to seven hours a day on devices. The cumulative amount of time children spend on their devices – and how close they hold devices to their eyes – should be a major concern for parents. Children’s eyesight is at risk as rates of nearsightedness continue to rise. A report from the World Health Organization indicates that nearsightedness is related to less time spent outdoors and more time spent completing close tasks with a downward gaze…in other words, more time spent playing Fortnight on their phones. Rates of myopia, or nearsightedness, are rising so rapidly that the Chinese Ministry of Education recently issued a notice encouraging limited use of electronic devices for children, in an effort to slow the spread and save their eyes. The human brain interprets blue light as daylight, which can interrupt the body’s circadian rhythm and suppress melatonin, the hormone that makes children sleepy. Meaning more screen time equals less sleep time. And while your teenager may think a little less sleep is no big deal, research proves otherwise. Studies have found allowing devices in the bedroom results in poor sleep quality, which leads to a whole host of other issues. Additional information from the Journal of Clinical Sleep Medicine discusses how lack of sleep in children is associated with behavior, attention and learning problems, as well as an increase in hypertension, diabetes, obesity and depression. Need any more convincing? In a recent observational study funded by the National Institutes of Health, researchers found that less than two hours of recreational screen time per day enhanced cognition in children. By now, you’re appropriately horrified by the amount of havoc blue light can wreck on your children’s health. But take a deep breath, because some solutions do exist! Encourage your children to hold their devices further from their eyes. Holding a mobile phone two feet versus one foot reduces the risk of blue light exposure by 75 percent. Add a blue light blocking filter, like EyeJust, to screens. EyeJust blocks blue light, lessening the negative effects of screen time and preventing excessive damage to your children’s eyes. Avoid using devices within two hours of bedtime. For example, finish homework on a computer well before lights out and then switch to a device-free activity like reading. This enables their circadian rhythm to kick in, ensuring high-quality sleep for their developing minds. Ironically (or perhaps helpfully), there are time limit apps you can add to your children’s devices to limit their usage. Leverage one of these or the new Screen Time feature from Apple’s iOS 12, which allows you to set a daily time allotment for apps and blocks them from usage once the time limit is reached. No more Snapchat Stories after 9 p.m., for example! Use software, like f.lux, or an app such as Night Shift to change the color of device displays, essentially providing a warmer light for night time use. The key takeaway here? Technology is a great thing – but like everything else, moderation and prevention are key to avoiding long-term damage. If your kids are glued to their gadgets, leverage some (or all!) of the above tips to help keep their eyes safe. Gigi Mortimer is a creative entrepreneur and Founder of EyeJust. She has built her career where science meets fashion.